Lifestart actively supports the integration of the Growing Child programme and home-visiting service into various family support structures. This way we can help integrate the Lifestart practice with statutory health promotion and child development/protection goals. The positive outcomes generated by the evidence-based Growing Child programme delivered through a home visit makes it an attractive option for bodies and agencies acting to promote and support better child development outcomes. The programme works for all families but can have greater impact where there are higher parental support needs. It can be offered as a universal preventive service and/or an early intervention service targeted at vulnerable families. In some geographical areas it has been integrated into the menu of family support services provided by statutory children and family support service providers and public health bodies. This latter mode of delivery has the advantage of addressing the vulnerability of first-time parents and those with greater support needs, while eliminating the stigma potentially associated with fully targeted needs-based provision. 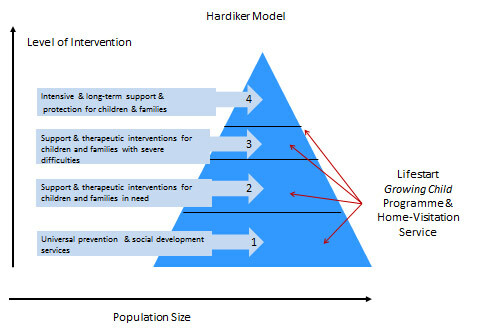 The Lifestart programme can have a role in both prevention and early intervention at levels one and two of the Hardiker model of children and family support services, and as a contributory service at level three or at level four when children are on their journey back into the care of their families. International evidence shows that good parenting can mitigate the risk factors associated with poverty and improve child outcomes regardless of family context or circumstance. The positive outcomes generated by the Growing Child programme and home visit make it attractive to organisations and bodies aiming to break the cycle of disadvantage by reducing the impact of poverty on child development outcomes.